A bit more on the iMasher. We feel there’s a huge market for pro mashing equipment. Mashing most often is the bottle neck in the whole distillation process, and many have asked us when we will enter that market. Well, as of now! We will offer the iMasher in various sizes. 150, 250, 500, 750, 1,000, and 1,500 liters. 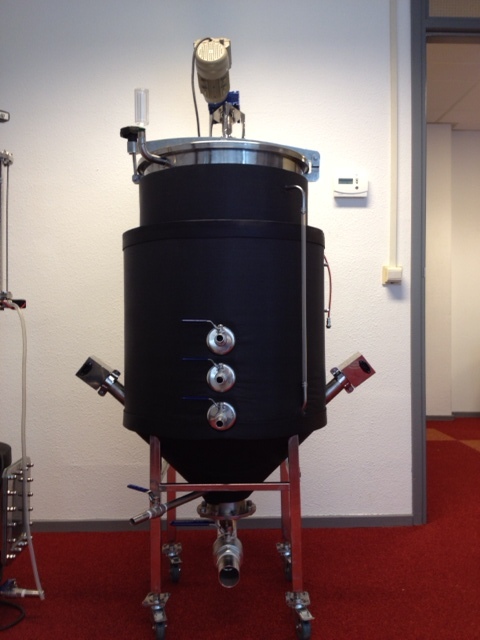 And – taken from the basic design of the iMasher – we will soon introduce the iFermenter range as well. Available in the same sizes as the iMasher. The iMasher can mash as well as ferment. But most pro distillers want to have one masher on multiple fermentation vessels. Mashing takes five hours, fermenting takes 5 days. So if you mash once a day and start up one fermentation every day, and you do that 5 days a week, you can distill 5 times a week. In that case … you need 1 masher and 5 fermenters. In our proposal that’s 1 iMasher and 5 iFermenters. What the iFermenter is? Simply put, it is a tuned down version of the iMasher. A fermenter doesn’t need a stirring device and there is some money to be saved that way. The iFermenter will have a computer controlled water jacket for constant temperature, though. Okay, back to the iMasher, if you don’t mind. We just assembled her this morning. The iMasher 150 that is. The stirrer is of the same design as the one on the iStripper. As is the engine driving it. The same, but on a smaller scale. A 120 centimeter ruther just doesn’t fit in a 150 liter mash tank, right? And we don’t need that many horsepower to drive the smaller charge either. Where the iStripper throws (in combination with the reduction gear box) 20 bhp to the ruther, the iMasher 150 has “just” 5 bhp. The stirrer is as strong as five horses. We put a fuse in, so it automatically stops when resistance is met and the engine has to put in anything over 2 bhp, but please do not put your arm, ever, when the stirrer is on! The iMasher 150 is equiped with a water jacket. The computer detects how much water is in the water jacket. And if the level is too low, it will open the water inlet valve and auto correct. Two 2 KW heaters warm the water jacket. Since the water jacket is a closed system, pressure will built up and above 100 degrees C temps can easily be attained. But heating in a closed system will develop pressure. So the iMasher is programmed in such a way that the heating will switch on and off, thus creating a sinoid that keeps the temperature between 0.5 degrees C.
There is a water outlet pipe as well. For multiple reasons. First, if you don’t want to use the iMasher for a longer period of time, you may want to drain the water out of the water jacket. Second, the water outlet functions as a blow off valve. An additional safety feature. In the theoretical case too much pressure builds up, it will automatically be released through the water outlet and into a hose, into a drainage system. The third functionality for the water outlet is cooling management. After mashing, you may want to bring the temperature of the wash down. In order to do that quickly, the iMasher will have fresh water enter via “water in”, while hot water is discarded via “water out”. For crash cooling (beer making?) as well as for small 0.5 degrees downwards temperature adjustments. Managing the iMasher is pretty easy due to the computer interface. First you choose the stirring. How many rounds per minute do you want? You then select various temperatures, and how long you want to keep the mash at those temperature. The iMasher will take it from there. For fermentation, you just dial in one temperature and keep it at that until fermentation is finisihed. And yes, the iMasher even has a water lock. For easy discharging, there is a 2 inch ball valve at the bottom. For easy draining, there are three outlets. In the case of the 150 model, the topmost outlet will leave 20 gallons in the masher. The middle outlet tap will leave 15 gallons in the tank. The lower outlet leaves just 10 gallons in the tank. Just so you can choose. For instance, when you want to distill or ferment a clean beer, you may want to use the lowest outlet. If you want to distill/ferment on the grain, take everything out via the 2 inch bottom drain. There’s a sight seeing tube running vertically along the tank, so you can always see what’s the remaining liquid level inside. Did I already mention it has four wheels so you can move it around? With brakes on them?